Pompeii erupts…in me. Not the Italian city that fell prey to volcanic demise centuries before I rose from the ashes, but the kamikaze ski-run in Deer Valley, Utah. My Pompeii runs steep with glistening patches of ice. As a 7-year-old, daredevil intermediate skier, I knew not of ash-laden historical precedents. I did know this: I had gone the wrong way. Or did I? One ski in front of the other, I bolted past seasoned-skiers and transformed dormant moguls into avalanches of ash. This run with mortality nearly proved my ruin, ejecting my skis like Mt. Vesuvius’ debris and leaving me bootless, brazen, and broken. EPIC WIPEOUT. That day, history was made: instilling me with a lifelong penchant for ancient civilizations, the motivation to delve into the intricacies of physics and the laws of thermodynamics, and an ardent desire to apply all that I am learning to many subsequent ski-clad encounters with the snow. In other words, my love for skiing propelled me into a whole slew of academic coursework that has challenged my footing yet inspired me to hone-in on diamonds in the rough, double black diamonds. Before it all seemed impossible, yet in putting my studies into motion, I have come to see that I’m-possible. I have not merely developed the skills necessary to ski and survive; it is in applying history and physics to skiing that I can strive, thrive, wholly alive. When put in the clutch, I really thought about what was most important to me. I ignored the outside talk saying that I was crazy not to pursue Dartmouth or Northwestern, two other amazing college options that had tempted me with their waitlists. I realized that this decision was about me and where I would grow the most. I realized that I needed a school with sports (as I have grown up a sports fanatic and would love to support my school after I graduate), a nurturing environment, a city, and flexible course requirements. Rice has the sports; its residential college system provides me with a chance to meet 200 of my closest friends and really get to bond with them over the next couple of years; it also has a reputation for being a collaborative environment rather than a cutthroat competitive environment like many of the Ivy’s. I’m not bashing on cutthroat, as some people thrive under that, but for me it would have not been the best fit. I also realized that I didn’t want to major in undergrad business, my main draw to Notre Dame, because I’d rather diversify my undergrad education and find and explore the minutia and courses I love. Though ND does a good job at insisting its undergrad business majors take classes outside of business school, I felt that Rice did a better job at this. Rice really encourages its students to explore all realms in pursuit of their educational foundation. Unlike most schools which have stringent general ed requirements, Rice has quite a lenient one which encourages students to take general classes in fields they like; rather than forcing a student to take Physics 101, Rice proposes the student take a physical science of their choice. Most importantly, Rice got a bigwig from Wharton to come over and head the economics department, my intended field of study. This is a huge plus as I would be learning from the best. Furthermore, Rice students also double and triple major and the programs presented at Rice are second to none and super unique. Like I said I’ve always had a love for sports and more recently the business side to sports. At Rice, I would be allowed to double major in economics and Sports Management, a unique program which applies business strategies to the sports world. I would then be set up with an internship with a Houston Sports Team! AWESOME! I felt that Rice’s programs at all the schools I got accepted to were by far the most intriguing in regards to what I wanted to pursue. 1) Location — is the school in a city? Is it easy to get to? Does the city provide opportunities for exploration and jobs/internships? 2) Recruitment — how is the recruitment coming out of school? Do companies recruit undergrads heavily? Is it easy to get a job with a company out of school? 3) Program — what makes the program offered at this school unique in comparison to the many unique schools out there? With my 3-step test that I realized so late into this process, I do not think I would have ever applied to my once dream school Duke. Duke is in the middle of nowhere, so it does not pass the location test. I mean, who wants to live in the worst part of the country, Durham, NC? NOT ME! Its programs didn’t seem that intriguing or unique to me, as they don’t have a unique major like Sports Management which Rice does. Recruitment wise, Duke does a good job but going 1/3 on my test doesn’t warrant an apply. A 3/3 warrants an apply. At this time, I can say that Rice is truly the perfect fit for me. It has everything I’m looking for in a school and does a great job in helping aid its undergraduates in their 4 year journey. 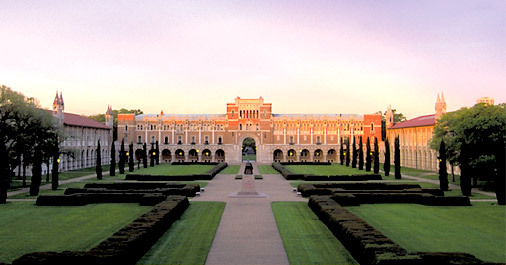 I feel like I can be happy and successful at a school like Rice. Looking back, it’s not about the brand name or the average SAT score or the US News ranking; it’s about what is the best fit for you and where you see yourself living for the next four years. These next four years are about YOU! Not your parents, not your grandparents, not your naive uncles, not your friends, but you! I couldn’t be happier to say that I am a member of the Rice Class of 2018…by far, the perfect fit for me. Sam and Sammy the Owl are going to spend their next four years together in Sam Houston’s town! Great essays take time and patience to craft. Sam benefitted immensely from tapping into his unique voice, creative ingenuity, assets, and interests and blending them unabashedly into all components of his application: his main Common App essay, his supplements, his extracurricular activity list, as well as his short extracurricular essay (the one we shared with you above). All of his essays reinforced his distinct, powerful, and authentic narrative and the specific talents and qualities he would bring with him to his best fit college campuses. They helped make him a standout, intriguing college applicant. Oftentimes besieged by the rigor of college preparatory curriculum, APs, and analytical thesis-driven writing, high school students lose sight of their narrative and the playfulness and joy that can come through their writing. I find that students that take the time to keep their creativity alive and write merely for the fun of it and as a means of invaluable self-expression oftentimes fare all the better in their college application process, a process that calls for deeply personal, authentic, and memoir-esque style writing. All students benefit from having a place to reclaim their voice and strengthen their written expression in such a way that it will impact their academic coursework, their ability to communicate poignantly, and their affinity for writing beyond the classroom and well into their adult lives. With this in mind, Rainbow Tutoring is offering our Ivy League Creative Writing Intensive this summer on-campus at UCLA! This all-grade-level, six-week writing workshop is the bootcamp students need to get a head start on their college writing, find their voices, or explore their creativity. For more information about the workshop or to enroll, contact Merry at 310-892-0383.